Wow!! Beautiful – Buddha at Ngyen Khag Taktsang Monastery. I cannot imagine the work that went into this. The picture shows a nicely carved, beautiful sculpture of Lord Buddha at an incredible mountain heights, claiming that it is a real statue of Buddha at Ngyen Khag Taktsang Monastery. But the fact is that it is not a genuine picture. 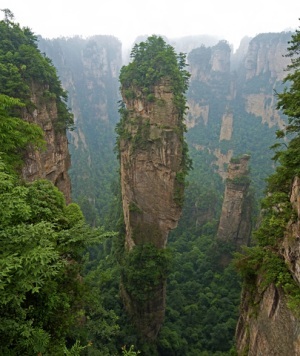 The original picture is simply a sandstone pillar of Zhangjiajie National Forest Park located in Wulingyuan Scenic Area in China’s Hunan Province. The forest park has about 3,100 sandstone pillars like these of varying heights, some reaching over 800 meters, residing amidst dense forests, lush valleys, lakes, caves, waterfalls and streams, all spread over an area of approximately 690 square kilometers. UNESCO has designated it as a World Heritage Site and a Global Geopark. Clearly, there is no such Buddha carving there, it is just another photoshop creation, but a good one indeed. The story is a hoax and need not be shared.